This week, the Seattle company launches Nuun All Day, which are like its original sport-oriented tablets but (as the name says) made for using in water on any regular day. It doesn’t have the high amount of electrolytes that Nuun Active Hydration has nor the high amount of sodium for replacing sweat loss. Rather, Nuun All Day is made to deliver vitamins and keep a person hydrated by giving water a subtle flavor to make it easier to drink. A company spokesperson told us that two tabs of Nuun All Day give the recommended daily value of vitamin C, E, B and D. It’s sweetened with stevia and does not contain artificial sweeteners. 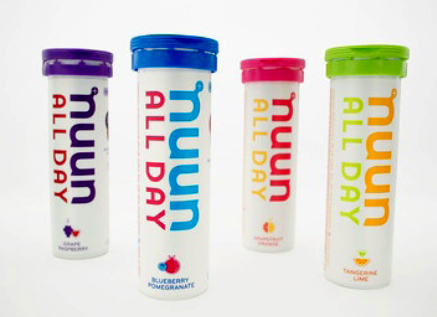 Nuun All Day costs about $7.50 for a tube of 15 tablets, or $30 for a four-pack of tubes. It comes in four flavors, Blueberry Pomegranate, Grapefruit Orange, Tangerine Lime and Grape Raspberry. See more details here on the drink-anytime dissolvable solution. previous:Bike Across the USA, Build Houses Along the Way!